1. Main beam headlamps (H7-55W). 2. Dipped beam headlamps (H7-55W). 3. Daytime running lamps / sidelamps (light emitting diodes - LEDs). 5. Front foglamps (directional according to version) (H11-55W)). 3. 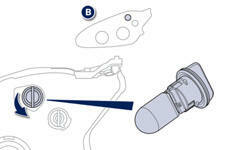 Daytime running lamps / sidelamps (W5-5W). 5. Front foglamps (directional according to version) (H11-55W). Rapid flashing of the direction indicator warning lamp (right or left) indicates the failure of a bulb on that side. Amber coloured bulbs, such as the direction indicators, must be replaced with bulbs of identical specifications and colour. 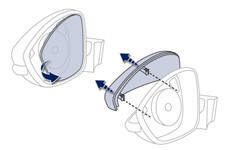 When refitting, close the protective cover carefully to preserve the sealing of the headlamp. Spread the spring to release the bulb (model A ). To reassemble, carry out these operations in reverse order, positioning the alignment lug at the bottom (model A ) or at the top (model B) . 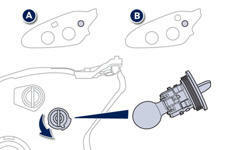 To reassemble, carry out these operations in reverse order, positioning the alignment lug at the bottom. Turn the bulb holder a quarter turn and pull it out. 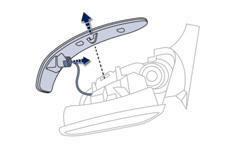 For the replacement of this type of LED lamp, contact a PEUGEOT dealer or a qualified workshop. 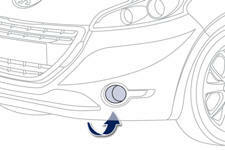 Access to the front foglamp is through the orifice below the bumper. Disconnect the bulb holder connector by pressing on the top of the tongue. 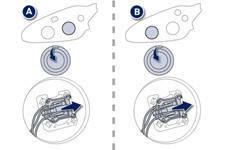 Extract the bulb holder by pressing on the two clips clips (top and bottom). 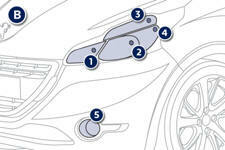 To obtain this module, contact a PEUGEOT dealer or a qualified workshop. 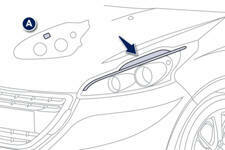 You can also contact a PEUGEOT dealer or a qualified workshop for this replacement. Insert a flat screwdriver between the mirror glass and its base. 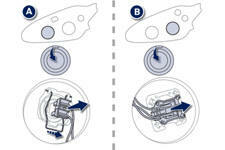 Use the screwdriver as a lever to extract the mirror glass. Unclip the mirror shell by pressing on the two retaining clips. Pull the bulb holder out and replace the failed bulb. 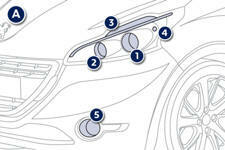 You should contact a PEUGEOT dealer or a qualified workshop for the replacement of these bulbs.